Quantitative methods emphasise on objective measurements and numerical analysis of data collected through polls, questionnaires or surveys. Quantitative research focuses on gathering numerical data and generalizing it across groups of people. A theoretical framework consists of concepts, together with their definitions, and existing theory/theories that are used for your particular study. The theoretical framework must demonstrate an understanding of theories and concepts that are relevant to the topic of your research paper and that will relate it to the broader fields of knowledge in the class you are taking. The theoretical framework is not something that is found readily available in the literature. You must review course readings and pertinent research literature for theories and analytic models that are relevant to the research problem you are investigating. The selection of a theory should depend on its appropriateness, ease of application, and explanatory power. The theoretical framework strengthens the study in the following ways. An explicit statement of theoretical assumptions permits the reader to evaluate them critically. The theoretical framework connects the researcher to existing knowledge. Guided by a relevant theory, you are given a basis for your hypotheses and choice of research methods. Articulating the theoretical assumptions of a research study forces you to address questions of why and how. It permits you to move from simply describing a phenomenon observed to generalizing about various aspects of that phenomenon. Having a theory helps you to identify the limits to those generalizations. A theoretical framework specifies which key variables influence a phenomenon of interest. It alerts you to examine how those key variables might differ and under what circumstances. By virtue of its application nature, good theory in the social sciences is of value precisely because it fulfills one primary purpose: to explain the meaning, nature, and challenges of a phenomenon, often experienced but unexplained in the world in which we live, so that we may use that knowledge and understanding to act in more informed and effective ways. Examine your thesis title and research problem. The research problem anchors your entire study and forms the basis from which you construct your theoretical framework. Brainstorm on what you consider to be the key variables in your research. Answer the question, what factors contribute to the presumed effect? Review related literature to find answers to your research question. List the constructs and variables that might be relevant to your study. Group these variables into independent and dependent categories. Review the key social science theories that are introduced to you in your course readings and choose the theory or theories that can best explain the relationships between the key variables in your study [note the Writing Tip on this page]. Discuss the assumptions or propositions of this theory and point out their relevance to your research. 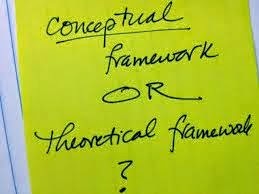 A theoretical framework is used to limit the scope of the relevant data by focusing on specific variables and defining the specific viewpoint (framework) that the researcher will take in analyzing and interpreting the data to be gathered, understanding concepts and variables according to the given definitions, and building knowledge by validating or challenging theoretical assumptions. Means to guide and inform research so that it can, in turn, guide research efforts and improve professional practice. The theoretical framework may be rooted in a specific theory, in which case, you are expected to test the validity of an existing theory in relation to specific events, issues, or phenomena. Many social science research papers fit into this rubric. For example, Peripheral Realism theory, which categorizes perceived differences between nation-states as those that give orders, those that obey, and those that rebel, could be used as a means for understanding conflicted relationships among countries in Africa. A test of this theory could be the following: Does Peripheral Realism theory help explain intra-state actions, such as, the growing split between southern and northern Sudan that may likely lead to the creation of two nations? Why is your approach a feasible solution? [I could choose to test Instrumentalist or Circumstantialists models developed among Ethnic Conflict Theorists that rely upon socio-economic-political factors to explain individual-state relations and to apply this theoretical model to periods of war between nations]. The answers to these questions come from a thorough review of the literature and your course readings [summarized and analyzed in the next section of your paper] and the gaps in the research that emerge from the review process. With this in mind, a complete theoretical framework will likely not emerge until after you have completed a thorough review of the literature. Clearly describe the framework, concepts, models, or specific theories that underpin your study. This includes noting who the key theorists are in the field who have conducted research on the problem you are investigating and, when necessary, the historical context that supports the formulation of that theory. This latter element is particularly important if the theory is relatively unknown or it is borrowed from another discipline. Position your theoretical framework within a broader context of related frameworks, concepts, models, or theories. There will likely be several concepts, theories, or models that can be used to help develop a framework for understanding the research problem. Therefore, note why the framework you've chosen is the appropriate one. The present tense is used when writing about theory. You should make your theoretical assumptions as explicit as possible. Later, your discussion of methodology should be linked back to this theoretical framework. Don’t just take what the theory says as a given! Reality is never accurately represented in such a simplistic way; if you imply that it can be, you fundamentally distort a reader's ability to understand the findings that emerge. Given this, always note the limitiations of the theoretical framework you've chosen [i.e., what parts of the research problem require further investigation because the theory does not explain a certain phenomena].